This week I sat down to work through Grace Goals and went through Workshop One on brainstorming desires. I even identified the ONE “gateway desire” I know God wants me to focus on. You know, the one thing that, when accomplished, will open the doors to the rest of the Promised Land, like Jericho did for the Israelites? I thought through some strategies and a suitable plan for this one goal and then the Lord gently stopped me. He convicted me that for some time, I’ve been throwing token actions at this thing but have lacked the wholehearted devotion God requires. I’ve been willing to go through some spiritual looking motions but my heart really hasn’t been fully “in.” I haven’t wanted to face the hard truths, get my hands dirty. I haven’t wanted to address the ugly issue. The issue I need to face, in fact, is a serious stronghold in my life. It roots back to childhood and is engrained so deeply in me that I can’t even imagine “normal.” Does that make sense? 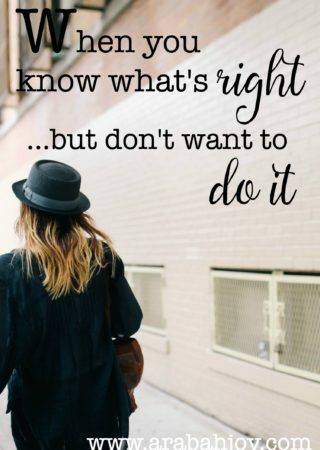 And this week I was left facing the fact that even though I KNOW what is right and what I should be doing, I, in fact, don’t want to do what’s right. Have you ever been there? Where you know God wants to deal with something in your life but you just keep balking? Avoiding? Distracting? Yes, well that’s what I had to get honest about this week. Yes, I know they are and I know I can’t fix myself. What’s worse (forgive me, Lord), I don’t really care. I’ve accepted this sin issue, like a crippled learns to live with a limp. Let’s just say it like it is: What a disgusting, pathetic place I’m in. What a sick state of affairs. The reason I share this at all is because what’s the point of lying? What’s the point of pretending? Doctors aren’t for healthy people and the gospel is for sinners. Thing is, I know the gospel. I know truth. But when it comes to this area of my life, that truth is not alive and active in me. It’s all empty. It’s not penetrating my dead, care-less heart. Well this week the running stopped. I can’t throw fake, Christian looking words and deeds at it and pretend (to myself and others) I’m making progress anymore. I sat before the Lord for some time just being honest. Confessing the filthy, dirty, unholy heart that included my sore lack of godly desires. 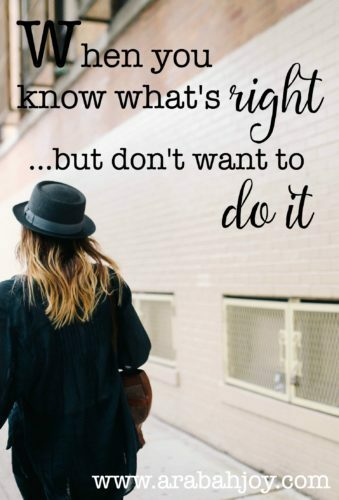 I’ve confessed the sin itself to Him many times… but I’ve never confessed my lack of godly desire, the fact that I like my sin, the fact I don’t actually want to do what’s right. It’s clear now that I’ve not gone deep enough or been honest enough with my confession. I was somehow holding to a sense of self-righteousness by confessing the sin but my failure to find satisfaction in doing God’s will. I hope that makes sense to somebody out there because I feel like I’m danged near confusing myself. Anyway, I sat there in all my nasty mess and truly had no idea where to start. The scriptures on the page all seemed meaningless. What an escape route that was! God justifies the ungodly… um, check. Clearly I am that. The means of being made right before God is not conjuring up a bunch of works and godly desires. It is by simply, purely trusting Him. God in Christ has redeemed my wicked heart that wants to remain in sin and He credits righteousness to me on the basis of my faith in Him and His character. What I don’t have in goodness I can make up with through simple dependence on God. That was the breaking point for me. The gospel became fresh, alive, and active to me once again. I prayed for godly, holy, righteous desires but I committed in the meantime to believe that God justifies the ungodly- me. He justifies my ungodly. He doesn’t ask me to work up some holiness. He asks me to simply trust Him as the One who extends justification through faith. This is the gospel I want pulsing through my veins, flowing from my lips, incarnated in my home. And you know what? As I clung to the God who justifies the ungodly and trusted Him for my righteousness, godly desire sparked to life. I was strengthened at the table of grace. Get to the gospel, my friend. If you lack godly desire to do what is right, eat at the table of grace. Feast on the provisions of Christ and fan the flame of desire at the fire of His capable sacrifice. Join me and let grace be what fuels and motivates us this year. P.S. The Lord also provided some specific scriptures to pray in regards to my stronghold. I’ll be sharing those next week. Wow, Wow ,Wow Is all I can say. Your word rang so true to my heart and I totally understood and related to every word. 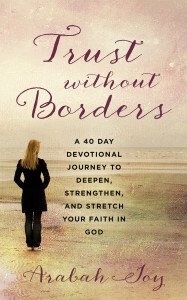 I won’t list all the ways I fail God or the struggles I deal with, but you opened a window of new understanding for me. Amazingly, I had picked a goal for the new year that is most important to me personally. I even had a bracelet made to keep me focused and as a testimony. The bracelet simply says “GROW IN GRACE” and that is what I’m learning and trying to do. Every moment, every day, every challenge. Yes, yes “Let Grace be what fuels us”…… Thank you Arabah. Wow and Wow! I will be honest I don’t usually follow blogs but your is one that has caught my attention and this was just so point on for my very own struggle this morning! Thank you for being so transparent and real! It is refreshing! I am going to print this out and put it in my Bible and would love to share it if that is okay through my blog once it is up and running! Thanks for sharing this, Arabah Joy. I am encouraged by your vulnerable testimony concerning how you have worked through this place in your heart with the Father. Thank you for posting this. I, too, have struggled with lack of godly desire, which has led me sometimes to question my salvation. Instead, may I rest in his grace. I’m there too, in that place you described. I’ve been there for years and it’s disgusting. I hate it. It was comforting to read how it’s not only me this happens to. I have felt such condemnation. I hope God brings me to the place where I can get free like you have. I think my husband and I are both stuck, in the comfortable paralyzing mud of apathy. I haven’t cared about anything in so long I feel dead. Thank you for being so candid and open and honest. I don’t know your stronghold but it could be me writing this if I were this brave. Thank you for this! You wrote out exactly what I have been struggling with lately. The realization that I am comfortable in my stronghold. That I repent of the sin act, but not the deeper layers…the origins. Wow! 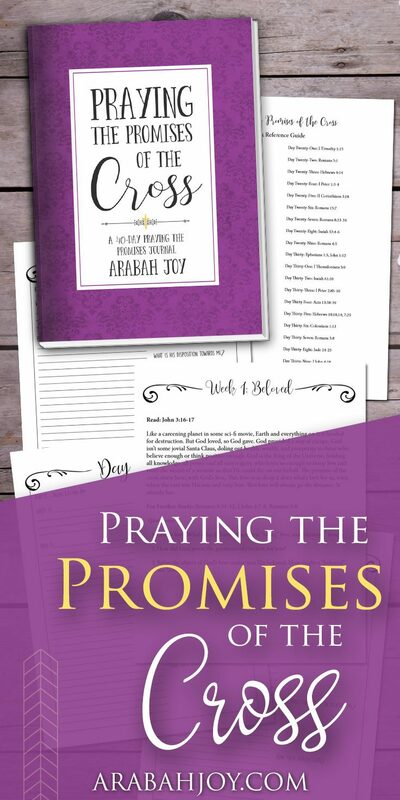 I have just begun your 40 Day/40 Promises, and through it, I finally recognize that I have not forgiven myself and that I have had a head knowledge of Gods forgiveness, grace, mercy and amazing love, but not a complete heart/spirit understanding. It is scandalous for me to not forgive myself. Scandalous to keep myself locked in my three walled prison cell. I am in fact saying, Lord, you are impotent. Your arm is too short. Christ is not enough. Oh, how this realization breaks my heart and at the same time, sets me free to trust in my God who loves me more than I can comphrend! Dear Arabah Joy, you have such a beautiful heart. Your honesty and openness are like a fresh spring rain – you are a blessing and inspiration to many, many of your “reading family”. I always look forward to your heartfelt posts. I am praying for you as you embrace what our Loving Father is doing in your life. Hugs. I SOOO needed to hear this! I am struggling with 2 things that I KNOW I should do, but don’t want to, and just like you said “..don’t care.” (Please forgive me for my shortcomings Lord.) And if anyone out there besides we two are dealing with this, we know how hard and embarrassing it is to admit it. Thank you for your honesty. I’ve written down the passages you gave, and will be meditating on them. What a blessing this is to me. Totally get it. All too well. Last month I had the rare and massive privilege of going on a retreat last month, and expecting God to prompt me with all sorts of such areas, He instead kicked off the weekend with a loud and clear, grace-drenched message straight from His Word: “I love you.” Duh. He always starts us with His grace–as if we can start anywhere else! But even the desires, you’re right, have to be inspired! Thank you. You totally make sense to me… because… you is me. I mean, I’m there. Now I need to apply the remedy. 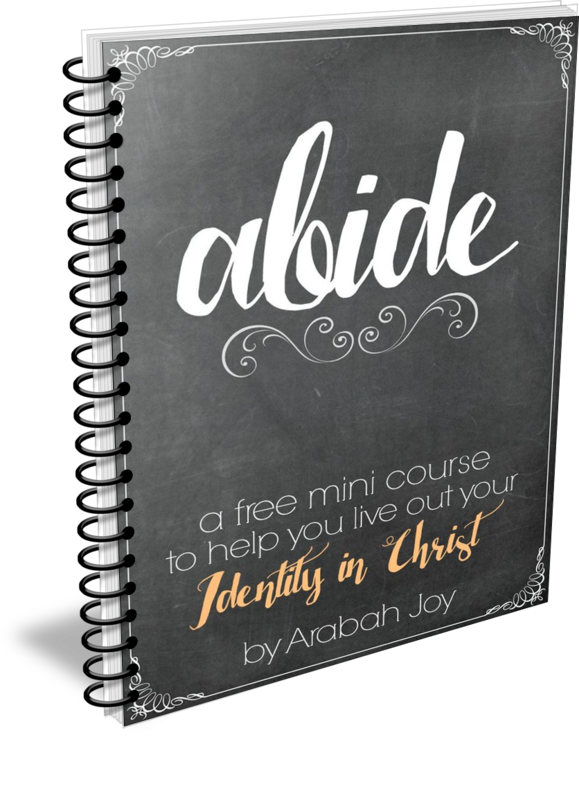 Arabah, as discouraged as you may feel, the fact that you dug into those Scriptures and created Grace goals has given you Scripture to fall back on for God to use in your life. Sometimes the best e-courses are born out of what we need to hear ourselves the most. In October I wrote about 31 Days of Communion and bringing the breaking of bread and juice back to our family tables to help deal with addictions and issues in our lives, and I know a number of people who saw breakthrough by taking communion each day and understanding why. Thank you for sharing that Lizzy! 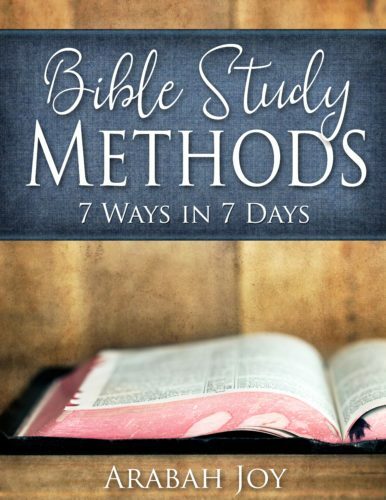 How encouraging to see what the Lord does when we obey. Thanks for what you are doing on your blog and in real life to serve Him and others. This spoke slap bang into my heart. I know there is a sin that I keep taking to God but not doing what he is telling me to do to actually break it. This has encouraged me to realise I’m not the only one, and that going to my knees and being vulnerable is the answer. Thank you for sharing so honestly. What a brave post, dear friend. Honored to be on this journey with you and challenged by your courage. How very brave of you to share this place in your heart. I fall into this sin as well – not motivated from a grateful heart. Sometimes I can’t even comprehend the depth of His grace but I’m’ so glad He has given it to us freely and we can tap into it through His word. Amen, sister. I appreciate you. I’ve been thinking about this post since the day you published it. I just had to come back and say thank you. I love what you said about the gospel, and how even our ungodly desires (or lack of desire) is covered by grace when we trust in Jesus. This is good stuff! I have had Grace Goals printed out for weeks now and have not been able to spend much time looking it over. I’m happy that tomorrow it looks like I’ll be able to carve out some time and dig in. Oh, friend, this resonates with me because I’ve been in the same boat – bailing water rather than fixing the leak at it’s source. I appreciate these words more than you know! This has really helped me. I just want to say thank you. I have no way of purchasing books or anything as I live in a nursing home so I really count of blogs with posts like these.